If you're in the States, there is a good chance you've heard of this latest holiday phenomenon, the Elf on the Shelf. I don't quite get it, but what I've gathered is someone wrote a book, attached a little toy "mischievous" elf to it, and the rest was left up to parents. Elves move around the house at night during the Christmas season and there's a morning search party where excited kids run around hunting for the elf and whatever trouble s/he's gotten into. Apparently the elves are designer too. 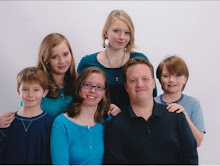 You can get a blue-eyed, blond, boy elf, or a brown-eyed, brunette, girl elf, or any combination therein. There's a DVD of the story, snow globes and ornaments, a plush toy, even elf clothing options: all the typical trappings of a holiday tradition. Until this year, I'd never heard of it. And even if I had, like my issues with Santa, I wouldn't have the time or energy or creativity to put into an elf program. But the Elf on the Shelf triggered a memory of my parents' tree. There was an elf there, or something that made me think of an elf. It's a little frightening and a touch creepy. Honestly, I never really liked that ornament. 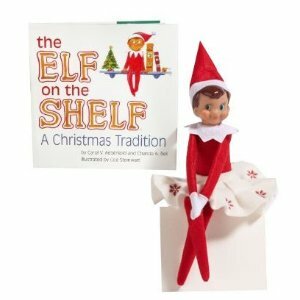 But until I learned that the book was written in 2005 (I guess anything that survives more than a couple years is considered a bona fide tradition), I really thought maybe we'd had the Elf on the Shelf elf since I was a little kid and just never knew it. As it turns out, close... but not quite. 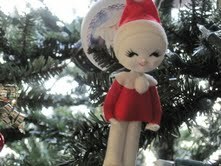 It's an old ornament with its own little history, and in some respects it could be considered cute. But yeah, I'm still glad it's on my parents' tree. And I'm glad that we missed the Elf rage last year (was there one? Maybe it's like Tickle Me Elmo and unless you have a kid in a certain age group all the hoopla just bypasses me) and it's no where to be found in Jordan. See, so many blessing to be thankful for.